Andrew McCarlie is an applications engineer with Prima Power, the machinery division of Prima Industrie Group; www.primapower.com. Punching technology has developed dramatically during the last 10 yr., including the introduction of linear drives, high-speed (up to 170 RPM) active synchronized AC drives for auto-index stations and turrets, precision 33-ton high-speed servo-electric punching and shearing machines, and the use of high-performance networked computer hardware and software built directly into the machines. These new-generation presses provide for greater flexibility and performance by not only increasing hit rate but by also providing new features that allow fabricators to combine numerous operations inside one punching work center. Multiple 3.5-in. 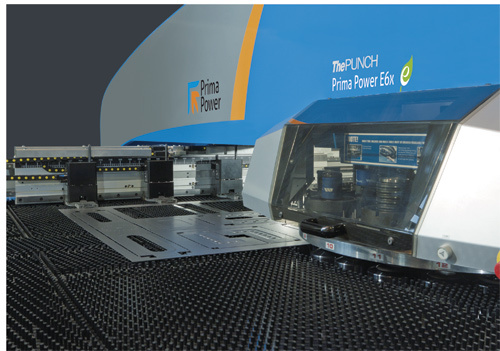 full extra-space tonnage indexing upform stations (10 or more in one machine) that combine a true upper and lower servo-electric punching ram allows for precision (0.001-in. increments) high forming and indexing simultaneously in the one station. This allows a fabricator to add more of these tools at any time, with an easy station changeout and reconfiguration procedure. While CNC punching machines have become more capable and flexible, selection of tooling has become easier and less complicated, thanks to new 33-ton servo-electric punching machines. These machines feature controls and a standard software interface that provides improved tool control and integrated setup software. And, with servo-electric machines, the need to have mechanically adjustable form tools is eliminated, as the tool adjustment for form height is built directly into the machine’s servo-electric control. Correct tool selection for a new high-speed punching machine is akin to selecting the tires for a new automobile. Using the wrong tires (or continuing to ride on worn tires) will compromise performance and may even cause damage to the vehicle. So it is with tooling and presses. To optimize machine performance, seek minimal tool changes by maximizing the number of tools that can be loaded into the machine, as well as the number of index stations and their size. For example, a fabricator can sleeve-down a 3.5-in. index station to a 0.5-in. station, but not the reverse, should it at some point require a larger station. Also, modern fully guided tooling in modern replaceable hardened guides and tool holders allows for a very high degree of tool alignment with minimal wear. This results in highly accurate nibbling with minimal tool wear, and can avoid the need for having a large number of fixed tools in a turret, rather than indexing. With quick-change dies and holders, and the use of large-capacity multi-tool cassettes that can be loaded offline, several tools can be changed quickly, with minimal downtime. To form in the press, fabricators can use full-tonnage indexing and upforming turret stations. These can allow for forming with the lower ram to minimize marking of the underside of the parts. They retract after use so that the fabricator need not remove the high dies from the turret afterwards. The quality of the material used to make punches and dies directly impacts the wear life of the tooling. With the high speeds punching machines now are capable of reaching, optimal tool life results when fabricators opt for tooling fabricated from high-speed tool steels such as M2 and M4. Combined with a fully guided punch assembly in a high-hit environment, use of high-speed tool steel will optimize performance. Another advantage of these tool-steel grades: They have a relatively high hot hardness and can be coated using a vacuum process, further improving their wear characteristics. In addition, fabricators can run these tooling grades in their older machines and enjoy significant tool-life improvements. With the latest generation of high-speed punching machines, the ability to minimize slug pulling is essential to maintaining productivity and producing good-quality parts. Die design has a great deal to do with this. Ideally, aim to have slugs exit the die on punching rather than pack into the die. Tabbed dies use protrusions to grip or pinch each slug tightly and hold slugs in the die. This can very effectively prevent slugs from moving back into the die. However, the edges of the slug can become deformed when several slugs are packed into the die at one time. Plain taper dies are less effective at retaining slugs at high punching speeds, although their performance improves with the addition of a slug-vacuum unit on the machine. Note: Fabricators should consider adding such a unit, regardless of the die design, on any new high-speed punching machine. Adding a double taper (with a pinch point at the intersection of the two tapers) proves particularly effective at avoiding slug pulling. The slug enters the negative taper and is pushed to the pinch point of the positive taper, or slightly below, allowing it to fall out. Fig. 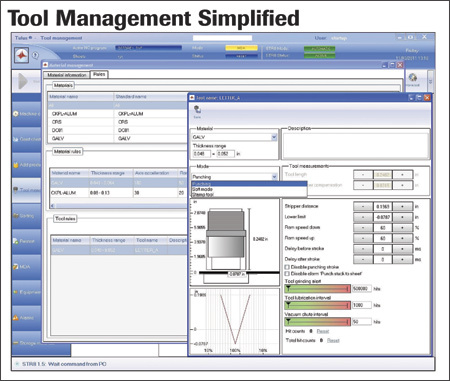 2—Tool-control software parameters can be set to different material types and thicknesses for individual tools. This only is required to be set up once in the control, relieving the press operator from having to set tooling parameters for each combination of material and tooling. 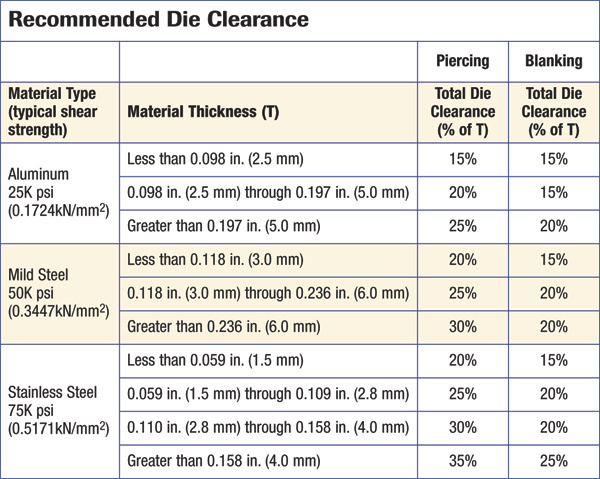 A note about die clearance: Significant damage can be done to a punching machine operating at high speed should the punch stick in the sheet due to inadequate die clearance. Excessive clearance can result in burring of the sheared edge, and poor hole quality. Correct die clearance becomes even more critical when punching thicker high-strength materials (Fig. 1). With the latest generation of punching machines, tool setup has become a much simpler one-off operation. All of the tool data, such as overall length, shut height, die penetration and stroke length, is established in the machine control. The control uses these parameters to calculate optimal punch depth, whether for punching or forming. Further, the tool-control software parameters then can be set to different material types and thicknesses for individual tools (Fig. 2). This is only required to be set up once in the control, relieving the press operator from having to set tooling parameters for each material and tooling combination. Note: Accurate, consistent tool lengths are required to ensure success. Also, saved turret layouts in the programming system minimize setup time by grouping jobs together by turret layout, so that multiple jobs can be run with the same tool setup. These turret layouts are identified on the program setup sheets. Minimizing setups will optimize tool performance. Tooling performance relates directly to the condition of the holders and their alignment in the turret. Look here first when noticing premature tool wear, chipping, sticky punches and saw-tooth cutting with auto-index stations. 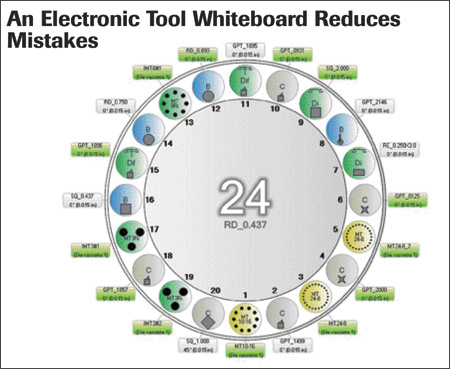 With improvements in computer hardware and software, along with closer integration of the programming systems, tool setup times are reduced, by having large, indexable, full-tonnage multi-tools to replace fixed tools at different angles in a turret, and by the ability to have a built-in electronic tool whiteboard on the control. This whiteboard automatically checks the NC program as it downloads into the machine, and changes it to match the tools in the control at the time. This also can reduce operation mistakes, as it alerts the setup operator should the tooling loaded in the turret not match that of the NC program. An easy-to-read screen on the control shows the turret layout along with the tools being used (in green) for the current program (Fig. 3). Last, but by no means least, is investing in a well-planned and executed tooling-maintenance program. Lack of routine tooling maintenance is a primary cause of poor press productivity and excessive downtime, along with diminished part quality. Fig. 3—An electronic tool whiteboard in the machine control alerts the setup operator should the tooling loaded in the turret not match that of the NC program. An easy-to-read screen on the control shows the turret layout along with the tools being used for the current program (in green). Correctly sharpened and lubricated tooling makes for consistently clean holes and minimal edge burr, along with reduced slug pull. With the punch speeds turret presses now are capable of, tooling should be sharpened when the radius at the cutting point reaches no more than 0.005 in. By sharpening tools at this point, fabricators can double the grind life of a tool and minimize machine downtime. • Establish written maintenance procedures. • Keep tools clean, and watch for wear—when punches dull too quickly, clearance may be too tight. • Remove galling by rubbing with a fine stone, parallel to the direction of the punching motion. • Watch for these possible signs of dull tools—excessive rollover, a noise punch press and a press that begins to work too hard. • Sharpen frequently, in small amounts —remove 0.001 to 0.002 in./pass and repeat until the tool is sufficiently sharp, typically 0.005 to 0.012 in. total. • Apply coolant with as much force and as close to the tool and grinding wheel as is practical. • Ensure use of the proper grinding wheel, and dress the wheel often by using a rigid single- or multi-point diamond. • After sharpening the punch tooling, lightly stone the cutting edges to remove any grinding burrs, leaving a 0.001- to 0.002-in. radius. • Provide the proper, recommended face geometry.• Observe proper setup practices. • Check press level and alignment and adjust as necessary. • Examine (and repair as necessary) punch and die holders for wear, and turret bores and die-holder seats for damage. Fix damaged keys. This is very helpful. God bless you.